We are grateful to have this monthly opportunity to share with you information about upcoming OBS events. For example, this coming Friday evening, August 3rd, Ayya Medhanandhi will be leading the group sitting and dhamma talk at Quaker House. Later in the month Ven Khemako will be in Ottawa for two meditation events on August 17th and 18th. Carefully and thoughtfully, month after month, over these last forty some odd years our dedicated guiding teachers and volunteer boards provide these opportunities for our silent contemplative practice together. So now, this is where we gather together: encouraging each other to take time, in the midst of it all, to listen from that deep centre of wisdom, ever appreciating whatever is given and where we begin again. 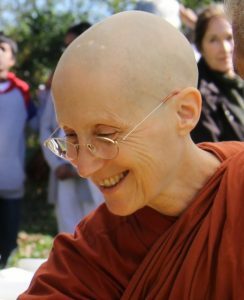 Ayyā Medhānandī Bhikkhunī, is the founder and guiding teacher of Sati Sārāņīya Hermitage, a forest monastery for women in the Theravādan tradition. The daughter of Eastern European refugees who emigrated to Montreal after World War II, she began a spiritual quest in childhood that led her to India, Burma, England, New Zealand, Malaysia, Taiwan and finally, back to Canada. In 1988, at the Yangon Mahasi retreat centre in Burma, Ayyā requested ordination as a bhikkhunī from her teacher, the Venerable Sayādaw U Pandita. This was not yet possible for Theravāda Buddhist women. Instead, Sayādaw granted her ordination as a 10 precept novice nun on condition that she take her vows for life. Thus began Ayyā’s monastic training in the Burmese tradition. When the borders were closed to foreigners by a military coup, in 1990 Sayādaw blessed her to join the Ajahn Chah Thai Forest Saņgha at Amaravati, UK. After ten years in their siladhāra community, Ayyā felt called to more seclusion and solitude in New Zealand and South East Asia. After nearly 20 years as a novice alms-mendicant nun, in 2007, Ayyā fulfilled her long-held wish for full ordination – she took her bhikkhunī vows at Ling Quan Chan Monastery in Keelung, Taiwan. 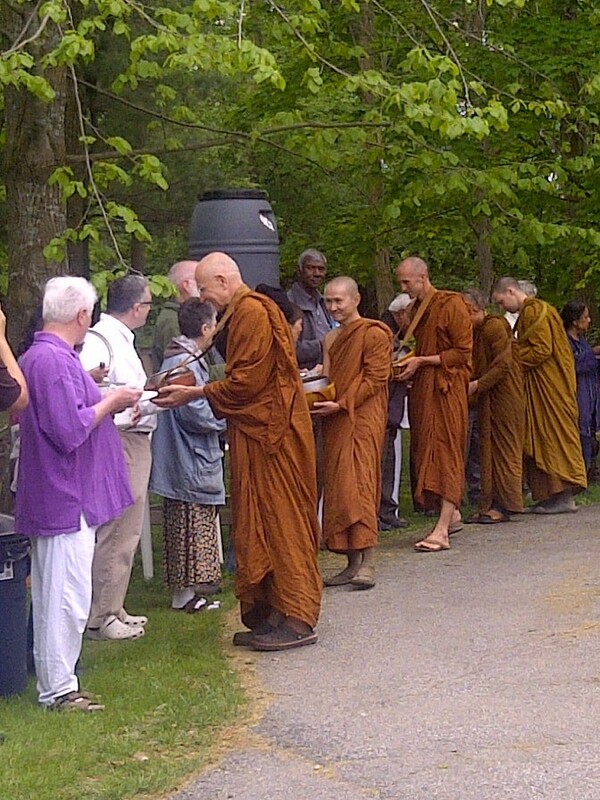 In 2008, on invitation from the Ottawa Buddhist Society and Toronto Theravāda Buddhist Community, Ayyā returned to her native Canada to establish Sati Sārāņīya Hermitage. Friday, August 17th and Saturday August 18th – Ven Khemako on Friday Evening Meeting at Quaker House 7:30 pm and Saturday 8:30 am to 3:30 pm at the Tu An Pagoda, OBS Days of Mindfulness . 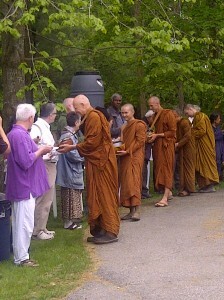 All food/dana for Tisarana Monastery , will be gratefully accepted and delivered to the sangha at Tisarana. ( click on the monastery link for current items needed).